Riding through the country side of Sri Lanka along the back roads and dirt roads will offer you views of rice fields, village life, rubber plantations, coconut plantations and wayside boutiques (shops). You will breathe the fresh air and feel the ambience of these serene landscapes. Hope this tour meets your expectations. Negombo - a famous fishing village North of Colombo. You will see a Dutch built Canal leading all the way to Colombo and the famous Dutch Fort bordering the beach. The canal itself is a hive of activity with all the fishermen traveling up and down in their adorned boats. This quaint town is also famous for its noisy fish market. Many churches in the area remind us of early conversions to Catholicism during Portuguese rule. East of the town at the Angurukaramulla temple is a 6 metre long reclining statue of the buddha worth seeing. South west of the town you will see the Negombo Lagoon which is surrounded by a densely populated region containing rice fields, coconut plantations and grassland. The mangrove swamps attract a huge variety of water birds including cormorants, herons, egrets and waders. After the breakfast proceed to Anuradhapura. Anuradhapura is the most celebrated of Sri Lanka’s ancient ruined cities. The city’s greatest treasures are its dagabas constructed of small sun-dried bricks hemispherical in shape. The most notable of these dagabas are the Ruvanveli which dates back to the 2nd Century BC and is 300 ft in diameter, the Jetawanarama is 370 ft and the Thuparama which enshrines the collarbone of the Buddha. The city’s most renowned relic is the sacred Bo-Tree which is said to have grown from a branch of the tree under which the Buddha gained enlightenment. It was planted 2250 years ago and is the oldest historic tree in the world. After breakfast ride through the countryside on a mix of tarmac and red dirt roads, passing orchards, paddy fields and elephant grass. Riding along the shores of Kandalama lake you will have excellent views of the ancient 5th century rock fortress known as Sigiriya (Lion Rock). We’ll park the bikes at the base of the fortress and walk through the old water gardens before climbing 300m to view the ruins of King Kasyapa’s summer palace. The highlights of this climb will be the impressive frescos, a mirror wall with ancient singhalese inscriptions and the ruins of the palace on the summit. After our descent we’ll head to a local restaurant for lunch. Sigiriya - Sigiriya is a massive rock which was transformed into a citadel during the reign of King Kasyapa. The capital and the royal palace were abandoned after the king's death. It was used as a Buddhist monastery until the 14th century. The rock fortress is famous for its frescoes and the mirror wall. Sigiriya today is a UNESCO listed World Heritage Site. It is one of the best preserved examples of ancient urban planning. It is the most visited historic site in Sri Lanka. After Breakfast cycle past the Kaladuwa Hills. This is a small climb to experience. The riding is on a good road surface. Watch out for wild elephants crossing the road as you descent. We’ll be riding along the forest edge which is part of a forest reserve until we reach the Polonnaruwa reservoir. Stop for lunch at a local hotel. We then ride through the historic park of Polonnaruwa, the 10th Century capital and best preserved of the ancient cities. Abandoned in the 13th Century, it was re-discovered in the 18th Century and is now a UNESCO World Heritage Site. The Brahmanic monuments built by the Cholas and the chiseled stone monuments show us the glory of the ancient Rajarata Kingdom. After seeing the main sites we’ll have a 20 minute transfer to our hotel along the banks of the reservoir. Polonnaruwa - The second most ancient of Sri Lanka's kingdoms, Polonnaruwa has been declared a World Heritage Site. Polonnaruwa was the capital from 11th -13th century A.D. Here the monuments are better preserved. The circular relic house (Vata-da-ge) Lankathilaka, Thuparama, Royal Palace, Rankoth vihara and Galvihara with the beautiful sculptured Buddha statues are interesting features of this town. 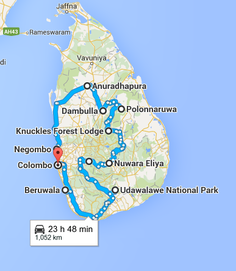 After a sumptuous breakfast we’ll cycle out of Polonnaruwa and proceed to Knuckles. Knuckles Mountain - It is a real paradise for those who love to hike, offering numerous mountainous trails that lead you across clear rivers, dense forests, waterfalls, tea plantations, terraced paddy fields and colourful Kandyan home gardens. The chance to visit traditional small mountain villages gives an interesting insight into the close-knit atmosphere that such a local community fosters. Today we proceed to Kandy via Matale, the spice centre of Sri Lanka. In the evening do a City tour of Kandy. Kandy is a major city in Sri Lanka. It was the last capital of the ancient kings' era. The City lies in the midst of hills in the Kandy plateau. Kandy is one of the most scenic cities in Sri Lanka; it is both an administrative and religious city. The sacred tooth relic of Lord Buddha is housed at the renowned Buddhist temple palace called " Dalada Maligawa". This temple was declared a world heritage site by UNESCO in 1988. Optional: transfer by Local train. You will join locals people on this journey. The diesel train will take you on winding tracks that pass through tunnels unfolding into beautiful scenery mixed with cascading waterfalls and lush green tea plantations. The climate will change from that of comfortable Kandy to cool misty mountains with nippy fresh air greeting you on very side. You will disembark at Nanu Oya railway station which is 6000 feet above sea level. Our representative will meet you at the station and transfer you to Nuwara Eliya for a City tour, including visit to the 18 hole Golf Course. Nuwara Eliya - The ‘Little England’ of Sri Lanka, is set against beautiful backdrops of Mountains, Valleys, Waterfalls and Tea Plantations. It is supposed to be one of the coldest places on the island similar to an English spring day, although the temperature does drop at night. Sri Lankan Tea - Tea was first planted in Sri Lanka in 1824, when a few plants were brought from China. More were introduced from Assam in 1839. In 1867, a Scottish Planter named James Taylor planted tea seedlings on 8 hectares of forest land, in the Loolkandura Estate. In 1873, the tea export industry of Sri Lanka began with a modest 23lbs being shipped to London. Tea will grow only on rolling terrain and is classified into 3 main groups of elevation as low grown, medium, grown and high grown. Kitulgala is a small town in the west of Sri Lanka in the wet zone rain forest, which gets two monsoons each year. The Academy Award-winning movie "The Bridge on the River Kwai" was filmed at a location near Kitulgala, although nothing remains now except the concrete foundations of the bridge. Kitulgala is also a base for white-water rafting, which starts a few kilometres upstream. In the evening, we can experience the thrills of a white water rafting journey down the Kelaniya river. After Breakfast proceed to Udawalawa. In the afternoon do the safari game drive at Udawalawe National Park . The national park was created to provide a sanctuary for wild animals displaced by the construction of the Udawalawe reservoir on the Walawe river, as well as to protect the catchment of the reservoir. It is a popular tourist destination and the third most visited park in the country. After breakfast proceed to Riu Ahungala for a relaxing beach stay. Stop to visit Galle Fort en route. Galle Fort, in the Bay of Galle on the southwest coast of Sri Lanka, was built first in 1588 by the Portuguese, then extensively fortified by the Dutch during the 17th century from 1649 onwards. It is a historical, archaeological and architectural heritage fortress, which even after more than 423 years maintains its original appearance, thanks to extensive reconstruction work done by Archaeological Department of Sri Lanka. After the breakfast, transfer to the airport in time to connect with your departure flight. 7 - 12 Backup truck & the coach. Water & Snack when cycling. The service of an English speaking National Tour guide throughout the tour – if the Group is 07 pax or more. Local cycle guide for all the cycling tours. Lunch or other beverages throughout the tour. Price can be quoted based on 02 Pax - Maximum of 20 Pax per group. Prices are net in USD and inclusive of applicable taxes as at 08.05.2013. Rates may change without a notice if there is a significant currency fluctuation , Fuel Increase or Revision of taxes occurs.